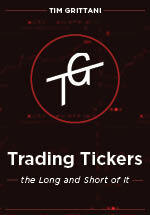 "Trading Tickers: the Long and Short of it" has one purpose, to make you a better trader. Whether you're completely new to the market or a veteran trader, there's something in this DVD for everyone. While the first four chapters lay the groundwork for everything that goes into my preparation before I even make a trade, the last eight chapters are where I dive into the specific strategies I use daily. Each chapter teaches a different setup that I play, including a grand total of 35 live trade examples! Experience my strategy as if you were sitting next to me watching me trade, listening to my every thought. You will see my entries, my exits, my successes, and my failures. But, most importantly, you will see WHY I make the trading decisions that I do.